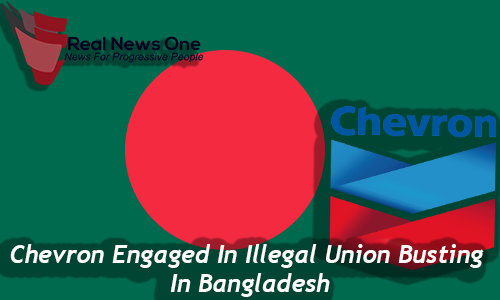 The U.S.-based oil company has been engaged in illegal union busting in Bangladesh. The oil company has actively and aggressively sought to destroy a newly registered union representing 463 workers at the Bangladesh based site. Chevron sacked 17 union workers including the newly elected leaders of the union after Chevron tried to mobilise police and security forces to blockade the union office. The workers at Chevron in Bangladesh have faced years of oppression and intimidation along with a precarious employment and unacceptable work conditions. Chevron has tried to deny any responsibility saying that they had not directly employed the people and claim that a third party labour broker was responsible for the employment. Union members and workers from the Bangladesh site have approach the IndustriALL affiliated national union, the Bangladesh Chemical, Energy and Allied Workers’ Federation (BCEF) for help.